A few months into the year, Mr. DeMarte noticed students posting polls on the board before class. “Is water wet?” “Is a hotdog a sandwich?” With only a few minutes of downtime, they would engage in lively debate over seemingly goofy questions. Mr. DeMarte could feel the energy in the room as they tried to outwit one another. 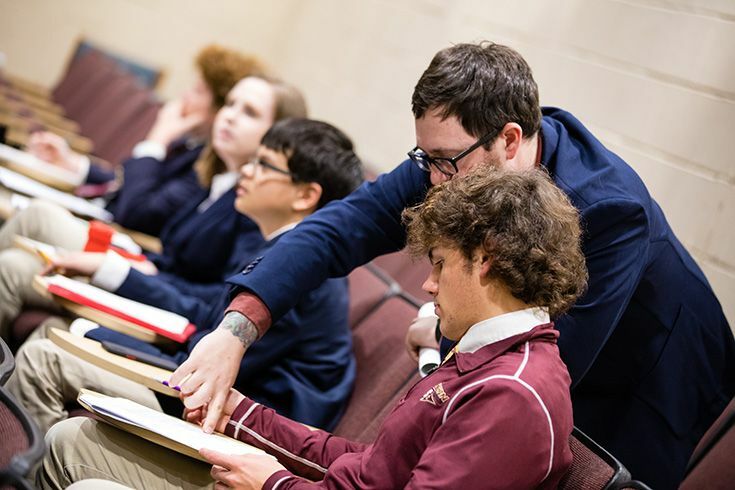 These informal conversations inspired him to channel that enthusiasm into something that would benefit his students for years to come, a formalized scientific debate. Are there benefits to holistic medicine? Is it too late to reverse human impact on global climate change? Do zoos do more harm than good? 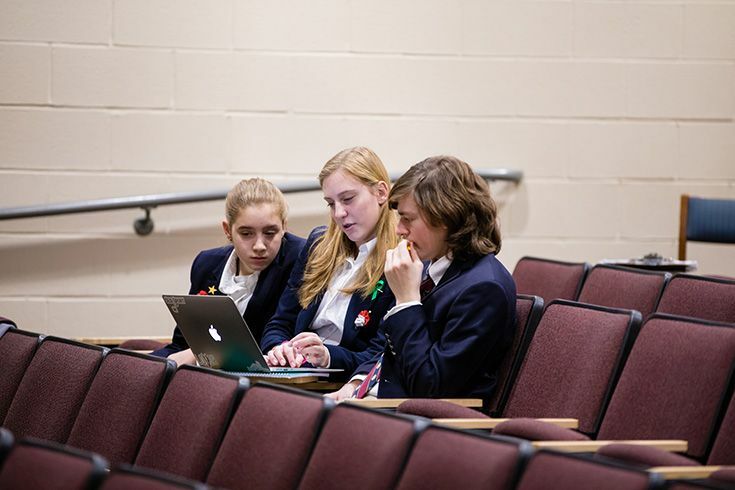 Students work in groups to conduct research and formulate their position statements using scientific databases and reference materials from the library. 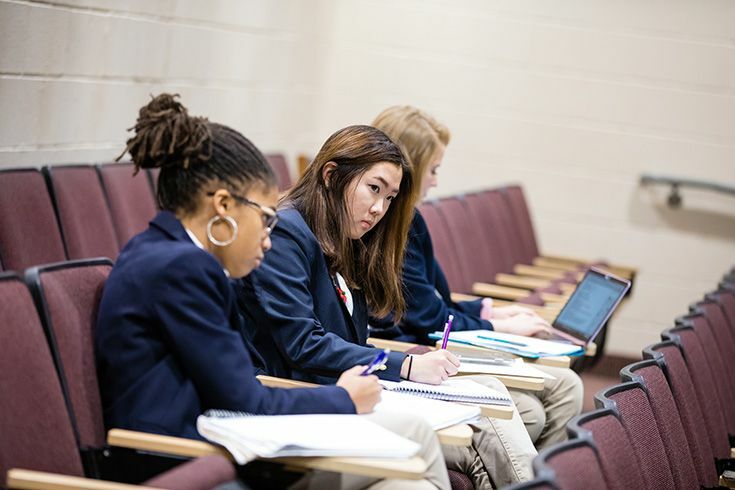 As our students work through their research, they learn how to evaluate sources of information to address specific scientific questions, communicate scientific ideas effectively, determine the merits of an argument based on evidence presented and counter an argument with data and evidence. 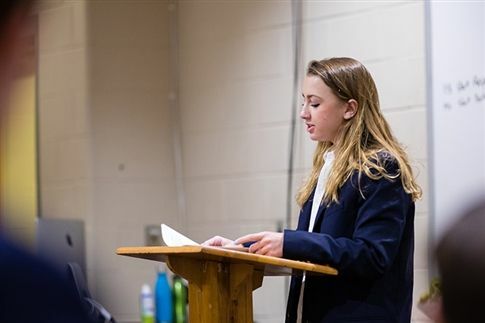 On debate day, students review their notes before presenting. Although the whole group prepares the remarks, one student speaks for each team. Mr. DeMarte works hands-on with each team as the debates progress, offering strategies to help them develop the strongest argument possible based on the evidence they have to review. Mr. DeMarte circles the room during breaks in the debate to offer suggestions. Student judges evaluate each phase of the debate and award points based on a rubric that Mr. DeMarte provides. They not only evaluate the spoken arguments, but also how the teams work together. When they award points at the end, they also present a statement to support their decision using specific evidence from the winning arguments. Student judges listen carefully while taking notes on every remark. At the end of the third day, the groups reflect on their experience. Mr. DeMarte stresses that no matter which team scores higher, everyone walks away a winner. Every student learns to carefully investigate opposing sides of a controversial topic and consider open-ended questions with curious and evidence-based thought. Authentic learning is something our teachers strive for in every class, in every discipline. Our teachers build lessons that not only reflect their students’ interests, but that are meaningful and applicable to their lives. 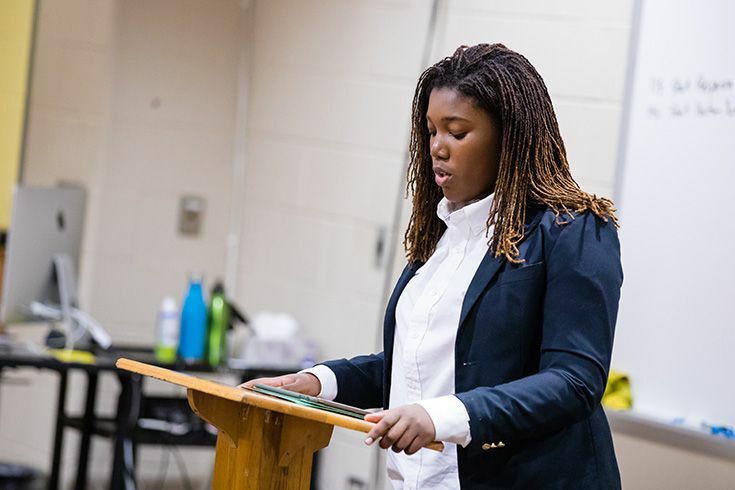 Through projects like these, our teachers model a passion for learning that motivates and inspires our students to take on new challenges, embrace diverse perspectives and grow as educated citizens of our world. At the podium during the first day of debates.